Ahhh! Can you believe that Christmas is less than a week away? That is plenty of time to get one last little Christmas craft in right? Yes, absolutely! I’ve been thinking up ways to put a little personal touch on the gifts I’m giving this year. Handmade Christmas gift tags are just the thing my plain packages (with store bought bows) were missing. I was browsing around the Yahoo! DIY site and was inspired by a few different handmade Christmas cards. Some use paper, some fabric, some buttons, and some stitching. So I started digging through my craft stash. 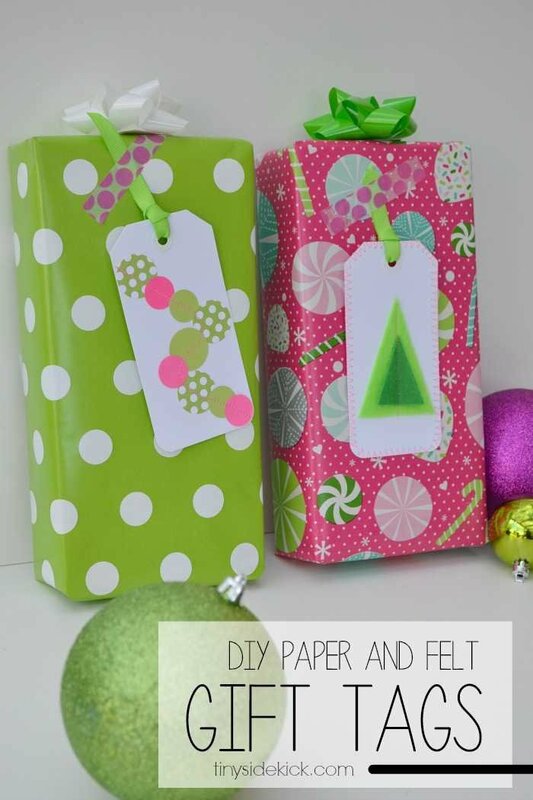 I knew I wanted to use bright greens and pinks to go with the fun papers I’m using this year, plus I love the modern vibe these non traditional Christmas colors give. Here’s what I ended up with after my digging effort. 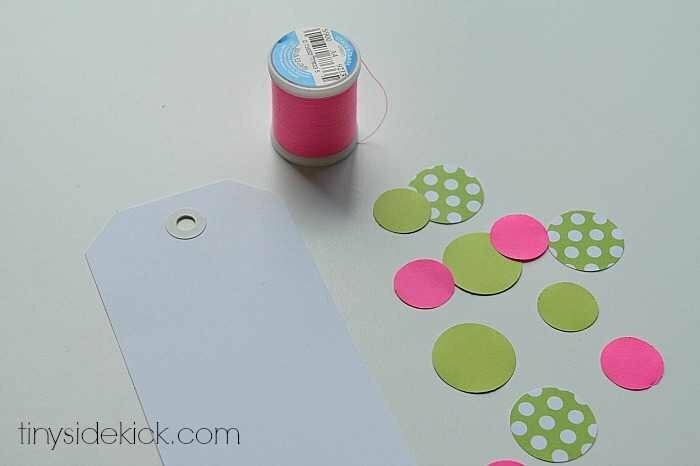 Some fun polka-dot scrapbook paper, 2 different colors of green felt, and hot pink thread. I now had a plan. I came up with 2 designs. One with felt and the other paper and since I needed a pop of pink on my paper design, I grabbed some pink post-its and used those! Hey they work right? Oh and of course you’ll need some tags. I had these ones that I found at the craft store awhile back, but you could easily cut some out of paper and hole punch them. First I cut 2 triangles (trees) out of my 2 colors of felt. 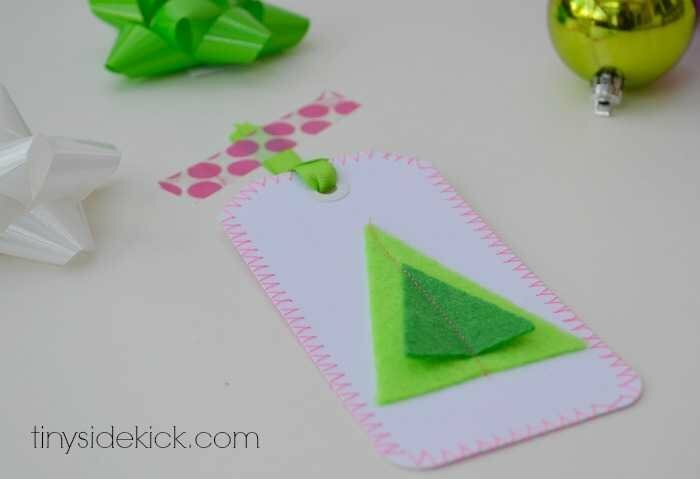 The size will depend on the size of your gift tag. 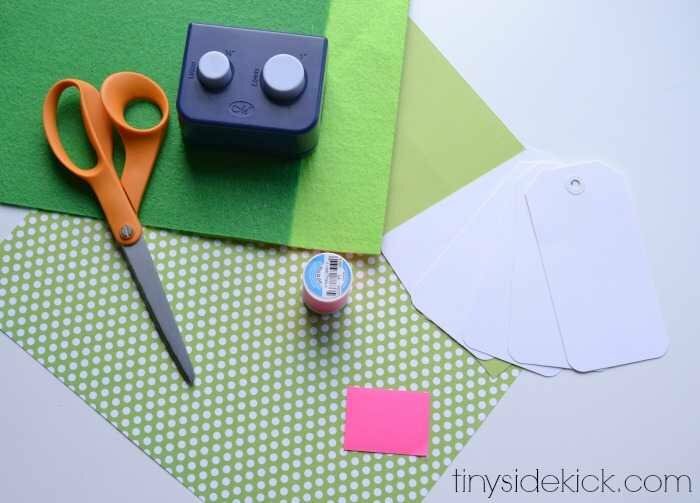 You’ll want to make each color a different size so that when you lay one on top of the other you can see both. 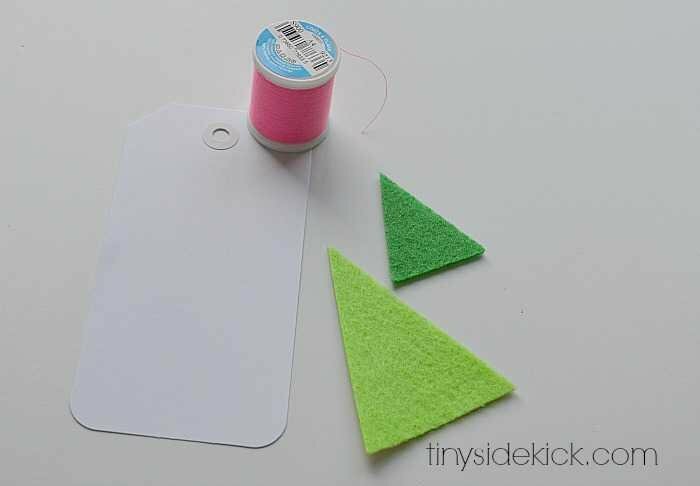 Then I laid them onto my tag and ran a stitch right down the middle of the trees with my hot pink thread. I went really slow with my sewing machine so that I was super sure that I was going in a straight line and going to end up exactly at the point of the trees. 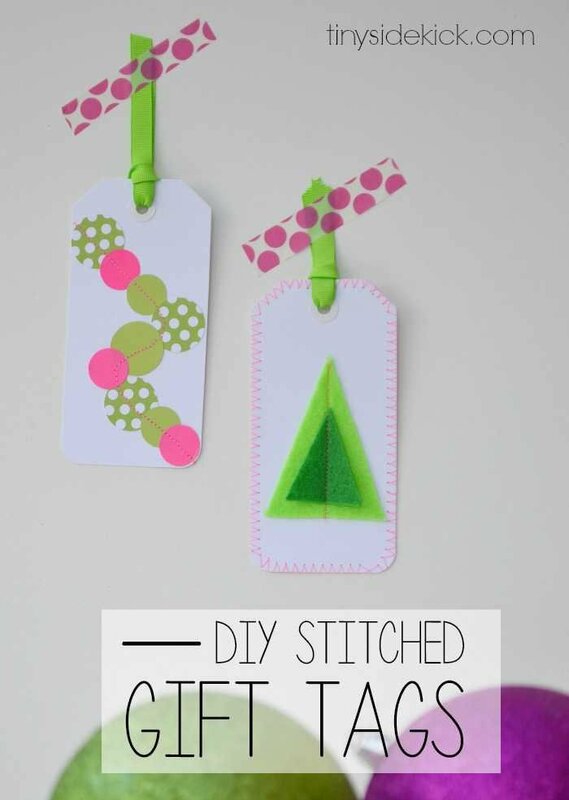 To add an extra pop of pink I also stitched around the edge of this gift tag using a zig-zag stitch. 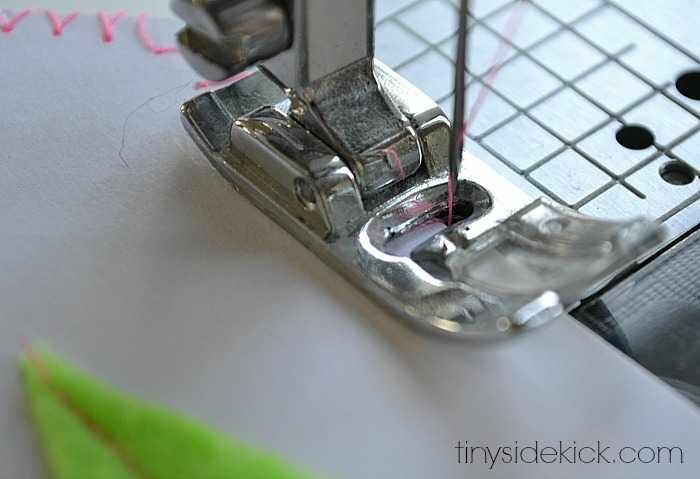 When you stitch around the edge like this you’ll want to be sure that your needle is landing just off of the paper on one side. I love the bright green with the pink and adding that stitch around the edge is the perfect touch of color and handmade detail! 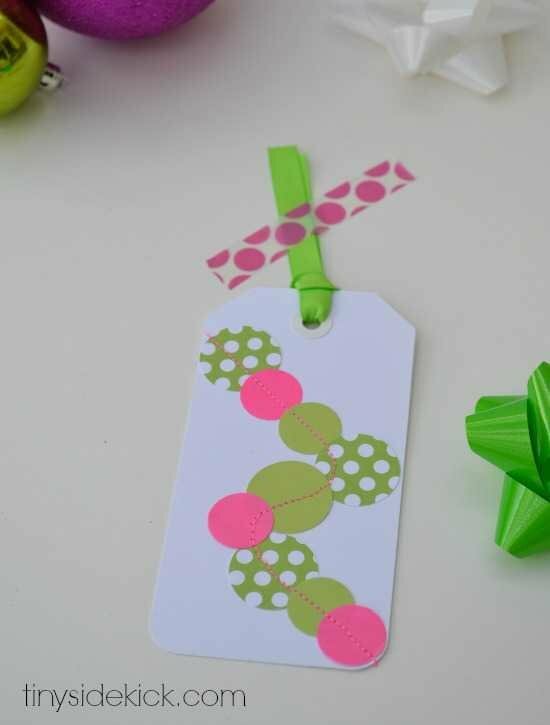 For the paper stitched gift tag I cut out circles in a couple different sizes using a circle paper punch. I used 3 different papers. Then I laid them out on the gift tag in a pattern I though looked good and ran the tag through my machine with a straight stitch. Again, I went really slow so that I was sure to stay in the center of each circle and be able to turn without goofing up. This design reminds me of the paper garland that I’ve been seeing around and love so much! I’m all about adding a little personalized touch to go with my store bought bows and these fun colors go perfectly with the fun papers that I’m using this year! I’ll definitely be using this idea again for different gift giving occasions! What do you think? Do you like receiving a gift with a little handmade touch on it? **Thank you Yahoo! for sponsoring this post. While this was a sponsored opportunity from Yahoo!, all content and opinions expressed here are my own. These are adorable! I love the colors and the dimension to them! This is a super adorable craft idea!! Love personalized gift tags.